Shirts With Random Triangles: Georgia and Notre Dame agree on home-at-home series for 2017 and 2019. In a statement, Georgia head coach Mark Richt said that the series "will be an honor and a great challenge for us." "I have a lot of respect for the job Coach (Brian) Kelly is doing there and I'm sure college football fans across the country will enjoy watching our two teams compete." Notre Dame head coach Brian Kelly returned Richt's praise with some mutual admiration. "These are two very attractive football games against a Georgia program that also has impressive history and tradition," Kelly said in a statement. "Mark Richt has done an excellent job keeping that program at the forefront, both in the SEC and nationally." Georgia and Notre Dame have only met once before in their storied histories. 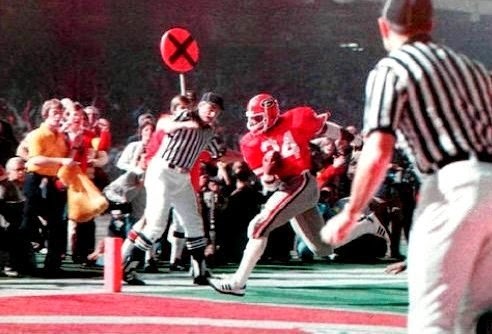 That was the 1981 Sugar Bowl, where the Bulldogs beat the Fighting Irish 17-10. That game cemented the unbeaten Dawgs' claim to the "consensus national title."